As part of the national Festival of Britain celebrations on London's South Bank in 1951, the Nottinghamshire village of Trowell was designated as the country's official Festival Village - close to the centre of the country, and displaying typical aspects of English rural life. 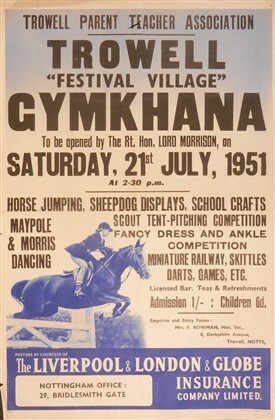 The poster shown here shows that the local gymkhana that year was branded as part of this. Does anyone have photos or memories of Trowell as the Festival Village? If so, please leave a Comment via the link at the bottom of this page. This page was added by Website Administrator on 14/09/2018. There is a list of events organised for the Festival of Britain for the whole country and Trowell gets a mention. The events listed there are - Provision of a new play park for children; Children's sports and cricket match; Garden show; Tree planting scheme; Special church service; Floodlighting and concert party; Historical exhibition. In the book "A History of Trowell" by Alan J Cook (1995) there is a section on the Festival village. It says the village was chosen from 1,600 other villages around the country to appear in the Festival of Britain Souvenir Programme as being representative of and English rural community - and one which lies within a few miles of the exact centre of England. The local Rector at the time also felt it had been chosen as it represented the type of English village where the old rural life was passing away and where an industrial community was being superimposed. Following Trowell's selection questions were asked in Parliament.. Labour MP Tom Driberg asked "Why Trowell?" to which Herbert Morrison (Parliamentary Secretary to the Ministry of Works) said the object was to encourage places which were not conventionally beautiful to seize the opportunity of Festival year to "have a go" at improving their amenities. "Trowell has been chosen as a villagw whose efforts to produce a worthy contribution to the Festival typified the spirit of such endeavour".